Sewers are often afraid to work with shiny, slick or squirrelly fabric. They love the look of silk charmeuse, silk chiffon or a slinky knit, but are afraid to give it a try because, quite honestly, it does slip and slide. Some sewers will baste the fabrics together. That is probably the most reliable, but I do not enjoy basting. It is like filling a hole twice. Hand me a needle and thread, and I'll rush through the stitches as quickly as I can to move onto the next step. But, pinning, I love to pin. I think it is because whenever I am on a project that requires me to pin-a-lot, I think of Moseley. Moseley was a maniac. In the rain, you could see him driving down the street, making the largest splash wave from his truck he possibly could. When he tested products for my designer husband, we would call it a submission to the "Moseley Destructo Test Facility". If it was physically possible to break something, Moseley would find a way. Then he would laugh. He always laughed. When my husband and I felt stressed with business, or life, or just like we were having hard times, Moseley would call with just one word.... Jaaaa....laaaaa....maaaa. We would jump in the car, drive 1-1/2 hours north and meet him at the secluded surf beach. Somehow, whatever was causing the stress mattered no longer. That was Moseley's gift. He was a party animal, who made everyone else feel as if their life was one big party every time he was around. My husband and I were in Paris when Moseley died. Our office called to give us the message that we were returning for his funeral. What a funeral it was. They had to open a side chapel at the Santa Barbara Mission to hold the overflow crowd. The Highway Patrol led a procession along Highway 101. On duty emergency personnel, firemen, paramedics and police, stood at attention at bridges along the way. I do believe Highway 101 was shut down for Moseley's procession. 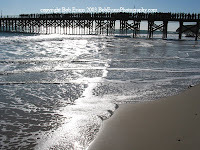 Along the entire length of Gaviota Pier, firemen in full dress uniforms held their gloved hands to their head and saluted to Moseley, while on the beach a Shaman from the Chumash Indian Nation sent Moseley on his way through the Western Gate. What I remember most of the entire event was when one of Moseley's pall bearers was tying the coffin to the back of his fire truck. My husband walked up to him and said, "If you can't tie a knot, tie-a-lot." At first the fireman looked angry at my husband, and then he smiled because we knew the code. Moseley had a lot of sayings and that was one. When working with slippery fabric, it will slip and slide while basting too. So, the best thing to do is grab a whole box of silk pins. It is very important that they are silk pins, so as not to leave holes in fine fabric, and PIN-A-LOT. I am a project person. I must always do. In fact, I am happiest when doing multiple things at a time. I find rather prophetic the scene from "The Man Who Fell to Earth" when David Bowie is viewing a wall of televisions broadcasting in multiple languages at one time. It looks exactly like the multiple windows open on my computer screen. When someone says to me, don't you ever take time to just "relax", to just focus on yourself. To just be. I say, "why". There is much to much to do. The upside of this psychological trait is that I do accomplish alot. There is also a funny side effect. I am "attached" to very little. Once it is done, I can very easily let it go. In fact, I rejoice in the mental click that goes off when I finish and task, and can move onto the next. There is always some other project or task that must be completed to fill the void. The same is true with the fabrics we sell at FineFabrics.com. I am in love with each and every one. I personally pick each by hand, and can visualize exactly what I, or one of my clients might make out of each. When one sells out, I let out a little sigh, but I also rejoice because it is an opportunity to fill the void with another beautiful piece. Yesterday, a very odd thing happened. 3-pieces walked out the door, all of which were on my list of "things to next make", two of which were part of current compositions underway. My skirt was widdled down to 1-3/4 yards of fabric. It clearly needs more. I was dreaming about this skirt. It was elegant. It was casual. It had volume and depth. It was simple and complex. It had style. It was chic. I was excited about it. It was the most exciting thing I have made in, well, I can't remember how long. I was attached to it and the idea of wearing it, but I had to let it go. Well, onto the next project! I rarely draft my own patterns and drape garments even less. Pattern companies have done the job of thinking out the pattern piece relationships, general nuances of fit, and any number of details. It simply saves time and headache to manipulate patterns to my desired end. In this case, the fabric alone is dictating the outcome. To force it into a preconceived shape would not work, so here I am draping the pleated skirt. The inspiration for this garment is the fabric. It is a patchwork of alternating large squares of cotton voile and muslin. They are sewn together in diamond squares. The selvage runs with the bias of the squares. It is a challenging piece with which to design. Until last week I saw it only as a big loose fitting coat, something like that in Eileen Fisher advertisements, or billowing curtains. Then, it screamed out to me that it wanted to be made into a skirt, but not just any skirt. It wanted to have its boxes manipulated into an interesting play of different sized diamond to box shapes. So, I pulled out my pins and started to play with how it might respond to pleating. The result was a series of diamond shapes half the size of the original to form a fitted yoke that opens into the full size diamonds. Then I decided to play with a horizontal side tuck on one seam to visually pull the diamonds to boxes along the hem. This resulted in shifting of the manipulated side seam from bias to straight grain. Along the hem, it shifts from bias to cross-grain, but I want to do this on only one side. 1) How I am going to keep the design clean around my hips. 2) What am I going to do with the side dip in the seam and peak to the front formed by the horizontal tucks? 3) What is the effect of the shift to bias on the lower right side seam? Will I have to mirror the side tucks on the back? Can I simply mirror the curve on the back side seam, or is this piece so uniquely constructed that it will break the rules and do what I want it to on the side if I keep the back 1/2 of this side seam straight on the bias? I've been tagged for a Getting To Know You meme by Liana of Sew Intriguing aka Liana, Adminstrator of Artisanssquare, a very sophisticated sewing forum. I would not normally get so personal on MsFineFabrics, but if challenged, you must rise to the occasion. 2. Entertaining alot - guests every weekend. 3. I am sure I was traveling, but cannot remember where that year. What are 5 things on your to do list today? 1. Schedule Mom with Easy Lift for Visits to Fine Fabrics. 2. Bookkeeping for Fine Fabrics. 4. Send thank you note to Director of New York Museum of Modern Art for complementary lifetime memberships for artist/designer husband and myself. 5. Take remnants and fabrics sold out down from FineFabrics.com. Snacks I enjoy - wonder from where my belly comes? Millionaires used to qualify for this question. Who says I am not...., in concept, at least. Same as I do now, but without the stress. Take a deep breath. Travel, at a wim. Buy property for store to exist permanently. Buy house for sale on beach for $29,000,000, or better yet, an island, that is high enough to still exist in 100 years, with plenty of fresh water and good soil. Learn to fly. Buy a farm in the heart of France. Invest more in DH's ship and energy projects. Entertain. Establish a foundation with world class Board to manage everything. What type(s) of work have you done? A talk I gave to a graduating class of Santa Barbara's Women's Economic Venture Group best describes who I am professionally. Peeps - I'll have to think about this one. I am new to blogs and I am still learning my way around. I will update later.